White and bright skin inside out is all I want and most of us want too. However, we faced skin problems like blemishes and freckles, pigmentation, acne, wrinkles and dry skin because of our unhealthy lifestyle, stress and hormonal imbalances. For all these miseries, Sato Pharmaceutical Co. Ltd., an established name in healthcare in Japan, with a presence in the US, Europe and Asia, introduce a new whitening series called the Hakubi White C Series with L-Cysteine, Vitamin C and B6 for healthy skin. 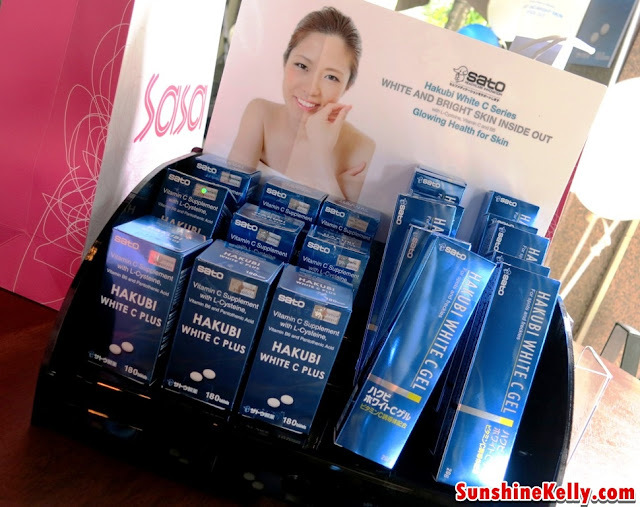 Hakubi White C Series was officially launched by DKSH Malaysia, Sato and Sasa Malaysia on April 18 2013 at the Sasa outlet in Bangsar Shopping Centre in Kuala Lumpur. Also present at the launch is the top model, actress and beauty entrepreneur Amber Chia. Hakubi White C Plus is an oral supplement that helps helps to promote good health for skin. It contains Vitamin C, L-Cysteine, Vitamin B6 and Calcium Panthothenate. It repairs skin that is marked by pigmentation, freckles and dry skin caused by stress and an unhealthy lifestyle. 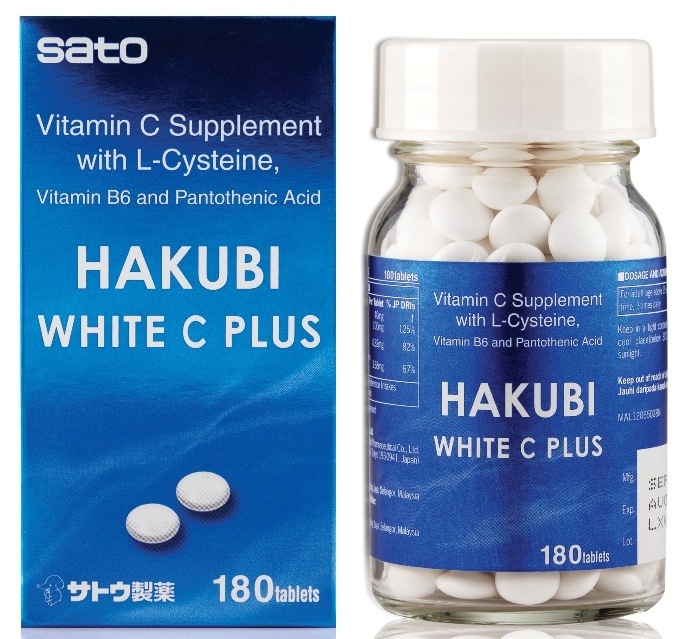 The Hakubi White C Plus offers a health supplement for internal daily use. For more information about this product you can check out at this link HERE. Hakubi White C Gel is for application on the skin with its high concentration of Vitamin C derivative is for applying on the skin. This gel reduces the melanin production and promotes skin metabolism for a healthy, glowing effect. The gel permeates the skin and reduces blemishes and pigmentation. Hakubi White C Plus 180's is priced at RM 115.90 while the Hakubi White C Gel is RM91.90. Hakubi White C Plus and Hakubi White C Gel are developed by Sato Pharmaceutical in Japan and distributed by DKSH Malaysia Sdn Bhd. 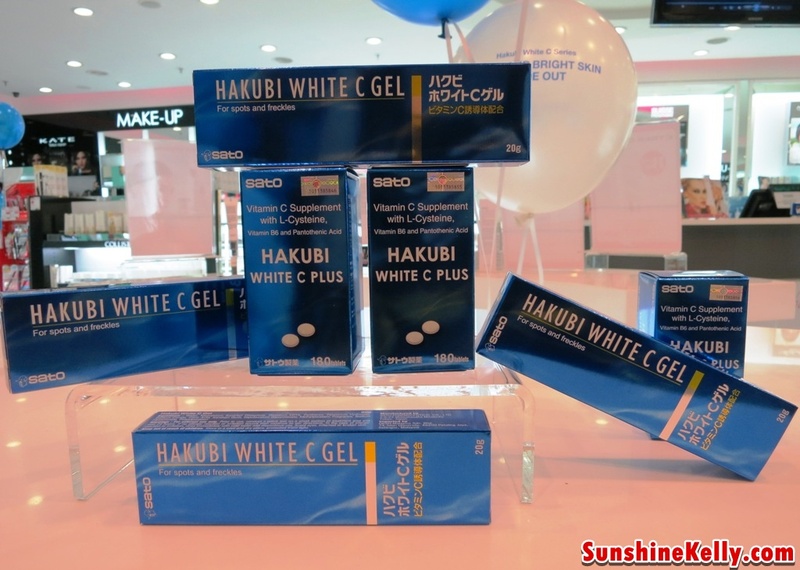 Hakubi White C Plus and Hakubi C Gel will be available exclusively at 35 Sasa outlets in Malaysia.